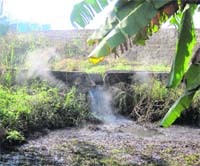 Tightening a noose around those violating norms, a team of the Punjab Pollution Control Board raided the premises of a Mukerian-based sugar mill and found the unit allegedly discharging contaminated water into a drain that flows into the Beas. 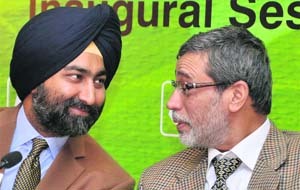 Punjab went virtually unrepresented during the inaugural session of Agro Tech 2012 organised by the Confederation of Indian Industry (CII) with Chief Minister Parkash Singh Badal cancelling his participation, ostensibly because of state mourning following the demise of former Prime Minister IK Gujral. The shortage of gunny bags has forced various procurement agencies to stock paddy in used jute bags. The agencies have so far received 5.90 lakh bales of gunny bags against the order placed for 7.71 lakh bales. In case you have lost an original document issued by the district administration and you have applied for its duplicate, there is a possibility that your application is rejected and you are told to apply afresh for a new document. The rice shellers of Bassi Pathana are up in arms against the Food and Supplies Department for its alleged arbitrary decision to shift the storage site from Sirhind to Bassi Pathana. The millers alleged that transporting the consignment to Bassi Pathana instead of Sirhind would cost more. A number of Congressmen, including several sitting as well as former municipal councillors, today joined the SAD at a function held at Jandiala. Public Works Department Minister Sharanjit Singh Dhillon today said five new high-level bridges would be completed by June next year at a cost of Rs 300 crore. Punjab is concentrating on vegetable and fruit cultivation for diversification but its inability to amend the Agriculture Produce Marketing Act (APMA) has come in for criticism from industry which wants perishable commodities be removed from the purview of the Act. The displays at the Agro Tech 2012 indicate that private players know better than agri experts and even the state government that land consolidation is taking place in Punjab and that farm operational sizes are becoming bigger. It is this market which the multinational companies are hoping to catch by displaying heavy-duty tractors, implements and technological solutions rather than cost-effective innovative farming methods for small farmers. The Confedration of Indian Industry (CII) is all set to launch Food and Agriculture Centre of Excellence (FACE) that will contribute to the ongoing policy dialogue on agriculture and food security concerns. The Punjab Government spent several crores to draw crowds at the inauguration ceremony of the third World Kabaddi Cup where top Bollywood stars performed. Now the government will pay a mere Rs 9.65 lakh to 11 folk singers who will perform at 12 venues during the kabaddi matches.These singers will be paid about 5 per cent of what the Bollywood stars were paid, say sources. A probe has been launched into the attack on a 21-year-old wrestler posted in the security wing of Punjab Chief Minister Parkash Singh Badal. Gurpal Singh, son of an IPS officer, was allegedly shot at and injured in Haryana's Sonepat district. The police is ascertaining if it was a case of mistaken identity. Even as a survey by the National Book Trust has revealed that Punjabi is dying as the preferred language for reading, experts blame the schools for the same. They say schools are promoting English at the cost of Punjabi. Also, there are only a few Punjabi writers who are taking up burning issues. Rural Haat, a scheme sponsored by the Central Government to promote the rural market system has fail to take off in the district despite the fact that lakhs of rupees have been spent on setting up one such market in Rampur village in the Ropar block while another is coming up in Chaklan village of Morinda. The Rural Haat at Rampur, set up at a cost of Rs 17 lakh, was inaugurated on April 18 this year by the local MLA so that small farmers and rural artisans could sell their products there. Patients in the district are a harried lot as a majority of posts for medical staff at government hospitals have remained vacant for a long time. At several hospitals, not even a single radiographer is posted leaving the patients with no choice but to go to private laboratories. The Director General of School Education Kahan Singh Pannu has directed all employees of the Education Department to get casual leave sanctioned from school heads in advance. 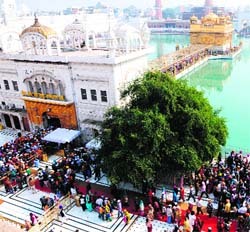 The Punjab and Haryana High Court has directed the Municipal Corporation authorities to conduct an inquiry and take action against officers who failed to take action against hotels running illegally around the Golden Temple. With the arrest of 11 persons, the district police has claimed to have busted two gangs of thieves and recovered stolen goods and vehicles worth Rs 26 lakh from their possession. A murder convict jumped parole more than two years ago, is still at large and the Patiala police are still conducting raids to arrest him. Led by Environmental Engineer Jagdish Lal, the Punjab Pollution Control Board (PPCB) team swung into action after several environmentalists brought the matter to the notice of Senior Environmental Engineer (Jalandhar) SP Garg. The PPCB team raided the premises of Indian Sucrose Limited and collected samples of the effluents being discharged into the drain. Confirming the action, Garg said the samples had been sent for chemical examination. He said, "The factory was caught discharging untreated waste into the drain in violation of norms. The unit could face closure if the samples test positive." Indian Sucrose Limited, however, denied the allegations. Unit's assistance general manager Anil Sharma claimed that the PPCB team did not visit the mill's premises and instead collected the samples from outside. "We have all arrangements in place on the premises to treat industrial waste. Why will we discharge waste water into a natural drain when we have the treatment facility?" he reasoned. A former member of Mukerian Municipal Council, Gurwinder Singh, alleged that earlier the unit used to discharge polluted water into the drain at night. But when their illegal act went unnoticed for several years, they started releasing the untreated effluents even during the day, he alleged. “Apart from causing water pollution, the pungent smell emanating from the effluents has made the life of those residing in colonies downstream the drain miserable,” claimed Sulakhan Singh, president of Punjab Rajput Sabha. * Stalls selling medicinal herbs like aloe vera and euro olive oil are getting high footfalls and doing briskbusiness. Visitors are not just buying the aloe vera juice, but are cosmetics made from it . For, a majority of official files have been left abandoned in a dilapidated canteen in the District Administrative Complex here, which is infested by rats. These files may be containing record of certain official documents. A visit to the top floor of the complex found that several important files were lying in the canteen. Though the canteen is not in use these days, its door always remains open and most of the documents lie scattered and easily accessible to the public. Even the documents, a majority of them of the year 2009, were in a bad shape. Either their pages were partially torn or dust gathered on them had made them illegible. Rainwater too enters the portion where the files have been kept as there are no windows there. An employee of the administrative complex said the documents had been lying there since long. “Most of the files are related to domicile and caste certificates and carry a number of documents as proof. Still, officials concerned are least bothered about them,” said the employee. Most of the rice is stored at Baladi Kalan village which is 14 km from Sirhind and 19 km from Bassi Pathana. The spokesman of the Bassi Pathana Rice Millers Association Lakesh Jindal said that they were already facing losses in view of the shortage of technical staff at the FCI. He said only 15 trucks load of milled rice per unit was being lifted daily as a result they were not able to get new quota of rice for custom milling. He said there were over 15 rice shelling units in the town with a stacking capacity of 300 trucks. He said that over 120 truckloads of rice were still to be lifted from the mills. Jindal warned that if the department failed to roll back the arbitrary decision, the association would be forced to intensify their stir. He said that they would also keep their units closed till the FCI appoints more technical staff to lift rice after custom milling. 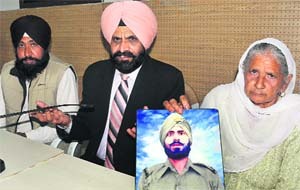 Prominent among those who joined the SAD are Ravinder Pal Singh Kuku, former president, Jandiala Nagar Council; councillors Kulwant Singh, Surinder Kaur, Vijay Rani, Sukhminder Singh Goldy, Tajinder Singh Happy and Rakesh Kumar Tonny; former councillors Baldev Raj Vinayak, Ashok Sharma, Haridev Sharma and Inder Singh; Mohinder Singh Virk, former vice-president, Jandiala Nagar Council; and Jagdeep Singh Judge, president, Youth Congress, Jandiala. The development is a setback for the Congress. “The move is bound to create ripples in the Congress camp. It will cause a major dent in the Congress vote bank in Majha,” said Revenue Minister Bikram Singh Majithia while welcoming the members to the SAD fold. “The development reflects a change in the image of the SAD, which is fast becoming a secular party. It is for the first time that a large number of members of the Hindu community together chose to leave their parent party to join the SAD,” he said. Majithia said people had realised that it was the sincerity and dedication of the SAD that could steer Punjab towards prosperity. These bridges are: on Sirhind canal at Roopnagar (Rs 90 crore), at Ludhiana-Rahon road near Mattewala on the Sutlej (Rs 63 crore), at Jhandha-Lubana-Dhnoya-Mukerian road on the Beas (Rs 63 crore), at Mirthal-Dina road on Chakki river (Rs 62 crore) and at Roopnagar bypass on Sirhind canal (Rs 12 crore). The Minister said work on all these projects was on full swing and by June, all these bridges would be opened to public. The state government had earlier opened six high-level bridges for transportation, which included an important bridge at Makkhu-Sultanpur Lodhi road on the Sutlej connecting Majha and Doaba to Malwa and a three-lane bridge on Amritsar-Jalandhar road, he said. Vice-Chairman and Managing-Director of Bharti Enterprises Rakesh Bharti Mittal today expressed the sentiments at Agro Tech 2012 here. He said farmers should have the freedom to sell their produce to anyone they wished. While commission agents had played a positive role earlier, now they had become money-lenders alone. “This has resulted in the creation of a Rs 12,000 crore parallel banking system in rural areas”, he claimed. Mittal said he failed to understand why the Act was not being amended. Amendment of the APMA had also been proposed by the Punjab State Farmers’ Commission which wants to give a ready market to both the producers of ‘basmati’ as well as vegetable producers who have taken to net house cultivation in a big way. The commission wants the state to give its approval for establishing private collection centres in rural areas. Farmers also feel that modern collection centres with chilling and packing facilities would help them to market their produce better. Vegetable farmers are facing a capsicum glut but are constrained to supplying the same to local ‘mandis’. The need for FDI in retail was also expressed by Mittal who said unless this was done, private players would not establish the cold chain which was necessary to market vegetables and fruits effectively. Mittal said the state needed to focus on increasing the income level of its farmers and that this would only happen if it started recognising and facilitating the private sector to invest in agriculture. He said industry on its part understood that the policy of land aggregation, under which no one could own more than 17 acres to 22 acres, would remain but this should not come in the way of leasing out land to the private sector. He said Punjab and Rajasthan had both allowed long-time leases which would not give the lessee tenancy rights. Bot there was little awareness on the matter. The CII Agriculture Council chairman said the state needed to open up for allowing movement of agriculture produce from one state to another. He said continuation of free power to the agriculture sector would result in misuse of water. He said the state could instead encourage micro and drip irrigation by making it mandatory for farmers seeking a tube well connection to adopt these techniques. The displays at the Agro Tech 2012 indicate that private players know better than agri experts and even the state government that land consolidation is taking place in Punjab and that farm operational sizes are becoming bigger. It is this market which the multinational companies are hoping to catch by displaying heavy-duty tractors, implements and technological solutions rather than cost-effective innovative farming methods for small farmers. A tractor company has sold two tractors worth Rs 20 lakh. Another company has sold vegetable processing equipment worth lakhs to another agri entrepreneur. Additional Secretary, Agriculture, Siraj Hussain, said the latest figures on Punjab being received by the Union Agriculture Ministry were bewildering. While almost all other states had reported an increase in their small and marginal farmers, in Punjab there had been an increase in big and medium farmers in the last one decade. Hussain said in Punjab, small farmers were opting to lease out their land instead of cultivating it themselves. He said 1.30 lakh small and marginal farmers had leased out their land and another 72,000 small farmers had sold their land. According to the Agriculture Census 2010-2011, the number of large farm-holdings has increased to 10. 28 lakh and the number of marginal farmer families have decreased to 1.01 lakh. It is not only big holdings above 20 acres which are on the rise. There are more than 2.79 lakh holdings of 20 acres. In contrast, the number of land-holdings of three to four acres is only 3.43 lakh. 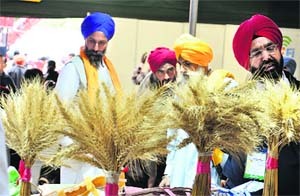 The Union Agriculture Additional Secretary said Punjab was in for trouble with other states picking up in wheat production. Wheat production in Madhya Pradesh had increased from 57,000 tonnes a decade earlier to 80 lakh tonnes now. He said in Punjab nearly all grain arriving in the market was procured by state agencies. He said this needed to change as the system could not be sustainable if the private sector was driven out of the market. Hussain said procurement by the state agencies could be gradually reduced with more participation of the private sector. Similarly, the private sector needed to be encouraged to participate in maize procurement. This was important as the Union Government had indicated it would not take the complete responsibility of procuring maize, touted as the best alternative to paddy. The centre, to be set up in Delhi, is being set up jointly by the CII and the USAID. It will be inaugurated by President Pranab Mukherjee next week. Talking to The Tribune on the sidelines of the Agro Tech fair, Chandrajit Banerjee, Director-General, CII, said the centre would improve competitiveness in the agriculture sector by catalysing innovation, building capacity and enhancing productivity. “This centre will work closely with farmers, companies, development institutions and the government, not just for improving farm productivity, but also to improve global competitiveness of India’s agriculture. USAID is a partner in this initiative and will help us create global linkages for agriculture and the agri industry,” he said. he said. The CII Director-General also said that the CII was working with McKinsey on a food and agriculture development approach. After the first World Kabaddi Cup, several Punjabi singers had come out with music albums glorifying kabaddi. While Bollywood actors, who only promote their upcoming movies from the World Kabaddi Cup stage, are paid hefty sums, folk singers who have promoted the traditional game through their albums are to be paid only a pittance. The Sportes Department will pay between Rs 60,000 and Rs 1 lakh to these singers, said the sources, adding that if the singers were to be believed, they were being paid less than half the money that they charged for performing at functions and concerts. Sikander Singh Maluka, president, Punjab Kabaddi Association, claimed that the government would not make any payment other than the award money to the winners. "All other expenses will be borne by sponsors," he maintained. But the Additional Director, Youth Services, Charanjit Singh, said it would be the Sports Department that would pay these folk singers. Gurpal was shot at on the Rai-Sonepat road while he was travelling from Rai, where he had come to attend a sports camp. "We have registered a case under Section 307, IPC (attempt to murder). Investigations are being handled by Sonepat's DSP (Headquarters)," Alok Mittal, Alok Mittal,Inspector-General of Police, Rohtak Range, said. “We have already registered a case on the victim's complaint. We are not trying to hide anything. The incident needs to be fairly investigated, which is what we are doing," he said. Gurpal was reportedly heading back to his hostel after 8 pm when a car blocked his way. Two or three armed men got down. A terrified Gurpal sped away, but a bullet pierced is back. HS Bhatia, former Head of the Punjabi Department, Guru Nanak Dev University (GNDU), said Punjabi was not directly linked with employment. The notion that English helped one scale new heights was wrong. “Look at countries like China and Japan which have given great importance to their mother-tongue and yet have progressed,” he remarked. He said there was a dearth of Punjabi writers who had a grasp on burning issues and, hence, the decline in Punjabi writings. Kendri Punjabi Lekhak Sabha general secretary Talwinder Singh said Punjabi was not being accorded priority in schools. He alleged that the government was not sincere in promoting Punjabi which had been "wiped out" in Chandigarh. He said it was high time that Punjabi was made mandatory in all schools. Rajinderpal Singh Brar, Head, Punjabi Department, Punjabi University, said the survey results were astounding in the light of a book fair organised by the National Book Trust in Bathinda recently, which had witnessed a record sale of books. “The findings may be true of the urban Punjabi populace but those in rural areas like reading Punjabi books,” he maintained. Until Punjabi was given priority in school education, the language could not be promoted, he added. Gursagar Singh from the Singh Brothers, a leading publishing house here, said Punjabi was not being given its due in public schools while government schools in the cities were in a bad shape. The scheme provides for a direct contact between the seller and buyer, eliminating the middleman. The Centre privides 75 per cent funds for such projects while the land is provided by panchayats. The remaining money is contributed by the state government. Families living below the poverty line (BPL) are allowed to set up vends at these haats without paying any charges. The others are allowed to sell their products at a nominal fee. However, owing to a lack of interest by the implementing agencies, no business has been transacted there. A visit to Bhai Jaita Ji Civil Hospital, Anandpur Sahib, which is a constituency of the state Health Minister Madan Mohan Mittal, highlights the state of affairs. The number of doctors at the hospital has dwindled from 18 to 11 in the last two years. No orthopaedician, surgeon, gynaecologist, ENT or skin specialist is posted at the hospital and the radiographer resigned recently. In the absence of a regular doctor who specialises in medicine, a doctor from Ropar visits the hospital once a week on Thursday to attend to the local patients. Earlier, over 300 patients visited the hospital OPD everyday but now with most of the specialists having left the hospital, the number has dropped to a 100. The situation is equally bad at the other two nearest hospitals at Nangal and Nurpur Bedi situated at a distance of 20 km. At Nangal, the civil hospital building is still under construction and does not have a radiographer. So people, who need to get an ultrasound done, are referred to the hospital in Ropar, said a doctor on duty. The hospital in Singhpura in Nurpur Bedi does not have a paediatrician and many cases are referred to Ropar. At Morinda hospital, the situation is no better as it does not have any orthopaedician, ENT specialist, radiographer or a medicine expert. Ropar Civil Surgeon Rajnish Sood said he was aware of the matter and that efforts were being made to address the issue. He also ordered that at any one time, the school head could not allow more than 20 per cent of the staff to go on leave. Upon joining, the female teachers get 20 and the male staff gets 10 casual leaves in a year. Earlier, teachers did not have to get their leave sanctioned as it was meant for emergency purposes but they now complain that the new order has defeated the whole purpose of the casual leave. Pannu said the only aim of issuing these directions was to ensure that the students didn’t suffer. “Teachers can always inform the authorities in advance. It is just a matter of sending an sms. We are not stopping them from taking leaves. It’s just that we want the schools to function smoothly. What if the entire staff goes on leave one fine day? Some structure needs to be put in place,” he added. The court has also directed that no fresh building plan be sanctioned in and around the “galliara” area of Darbar Sahib till further orders. The High Court passed these orders recently during the hearing of a civil writ petition filed by the Punjab Human Rights Organisation, an NGO, regarding mushrooming of unauthorised hotels around the Golden Temple. “The Municipal Corporation Commissioner is directed to conduct an inquiry and take action against those officers who were/are responsible for not taking action during the period of their postings against such hotels and allowed these to start functioning,” it said. Deputy Commissioner Rajat Agarwal, in an affidavit filed in the case in May, had stated that 21 hotels situated in the vicinity of Harmandar Sahib were served with notices to stop functioning. However, some owners had approached the high court invoking writ jurisdiction and got the stay. The court later observed that the issuance of notices to 21 hoteliers proved that these were being run illegally in connivance with the MC authorities. Therefore, the MC Commissioner is directed to conduct an inquiry and take action against the erring officers. The court also asked the commissioner to produce original applications filed by hotel owners and whether they had got any building plans approved. aDharampal Gupta, MC Commissioner, said they had provided a list of officials as sought by the court. “It’s quite a long period of 25-30 years and many officials have retired or died by now,” said Gupta. A nine-member gang comprising youths from local villages was involved in the theft of goods in more than 15 schools. The police recovered 29 LEDs, 7 CPUs, three gas cylinders, one cooking range, a white Verna car, stolen from Delhi, and three Splendor motorcycles. The gang used to sell motorcycles and cars after preparing fake documents and number plates for the vehicles. Similarly, police arrested a three-member gang of vehicle thieves, who used to steal only Bullet motorcycles. The police recovered two motorcycles from their possession. Senior Superintendent of Police HS Mann here today said that Inspector Chand Singh, SHO, Mulepur, got a tip off that one Amandeep Singh alias Happy, resident of Naulakha village, was involved in some anti-social activities. Amandeeep ran a computer repair shop, Mann said. The SSP said that he formed a team to keep a close watch on Amandeep. In the meantime, they received several complaints from schools in the area that computers and goods had been stolen from their premises. He said that the police arrested Amandeep Singh and interrogated him when he admitted to forming a group of youths who stole computers, gas cylinders and other items from schools. Thereafter, the police arrested the other members of the gang identified as Harvinder Singh, Jatinder Singh, Devinder Singh, Gurtej Singh, Balkar Singh, Gurmukh Singh and Satinder Singh. Kulwant Singh, however, is at large. All the youths are residents of the villages in the area. The SSP said that the police had got the accused in a four-day remand and added that more theft cases were likely to be detected on further interrogation. Mann said they had arrested all three members of the second gang and recovered two motorcycles from their possession. They were identified as Mandeep Sharma alias Vicky, resident of Mohali, Gurpreet Singh alias Prince, resident of Morinda and Vinod Kumar, resident of Jatpura. They used to steal Bullet motorcycles from Chandigarh and already had many cases of theft pending against them, he added.